You'll love visiting these great water parks in New York. During the summer the best way to have and cool off at the same time is to visit water parks in NY! Slide, ride, splash and soak at these great New York water parks. Take a Mini Vacation to this Great Water Park! Kids and adults will love this great water safari. The perfect way to have fun and cool off at the same time so to ride the many thrilling water rides offered at Water Safari Enchanted Forest. Bring the whole family and your bathing suit and towel for some unforgettable fun. Ride their 1,100 foot family tube ride that floats you all through a winding jungle stream. Or check out Cascade Falls, a 500 foot water slide! When you're done getting wet this NY water park has plenty of dry rides and attractions including bumper cars, a carousel, a tilt-o-whirl and much more. There is so much to do and see at this water park, several lodging options nearby mean you can make a weekend out of it! One of the Top Indoor Water Parks in New York! Need a place to get away for a weekend with the family? Then you won't want to miss Great Escape Lodge! Located near Lake George in the heart of the Adirondacks there is not only a lot to do outoors but there's a huge NY indoor water park! The weather is always warm in this water park where you can ride through tunnels, slide down slides, surf, swim and soak. There are many activities to do and there play areas for even the smallest visitors, so bring the whole family for some great fun! The lodge has accommodations for families of all sizes so book your stay now! One of the Top Water Parks New York Can Boast! No less than twelve slides await you at Splish Splash, from tube slides to extreme body slides you'll love the rush and thrill of zooming down and splashing at the bottom. Enjoy floating along the Lazy River or getting soaked in the two wave pools - these are great ways to take a break and cool down. Bring the whole family! 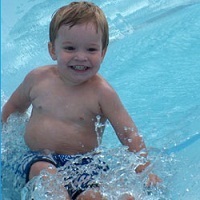 There are several pools and slides geared toward younger visitors who want to have fun too. When you want to be dry for a bit, many dining options are available from the restaurants and snack shacks to the Funky Pirate candy and dessert shop. Fun Water Playground in NY! For something a little different than a normal water park in NY, try White Post Farms' Splash Zone! This water playground is filled with fun inflatable water slides of all types and heights. 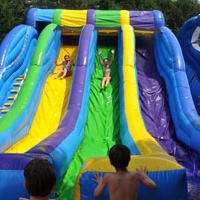 Kids will love running, jumping, sliding and splashing on these fun slides and play places. Costumed characters make regular appearances to the delight of children of all ages. When kids are done playing and cooling down in the water, they can dry off and have a pony ride, play on the playground and visit the petting zoo and farm which is attached to the Splash Zone. Goats, zebra, lemurs, sheep, many kinds of birds and much more can be seen here! Splash Zone is open June through September. Too hot at home? Need a break from your rush and everyday activities? The right place you want to be in is the Water Slide World, one of the most exciting water parks in NY. Take your friends and family and enjoy riding on the Amazon Adventure River or playing volleyball on the sand or in the water. Water Slide World offers free parking and free tubes. Non-swimer? No problem, you will get a free lifejacket. You can also bring your own food and beverages. You can choose the daily ticket (the price starts at $10.95) or the season pass ($65/visitor). Come and have fun in the water! If you want to escape from the extreme heat in the city, you should come to Zoom Flume, one of the best family water parks in New York. 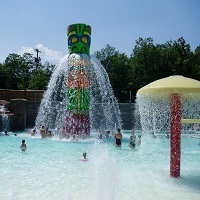 It is situated in the scenic northern Catskill Mountains, and offers safe water fun, and plenty of attractions and excitements to thrill guests of all ages. 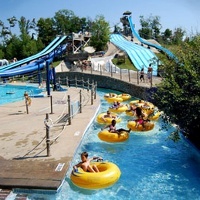 You can catch a wave in new Riptide Cove Wave Pool, zoom down giant winding water slides, challenge the 10,000 gallon-a-minute “Wild River Ride” rafting down a 600-foot chute, or just relax while drinking a refreshing beverage. Zoom Flume provides free parking, a food court, plenty of seating areas and other facilities that will make your vacation enjoyable. So bring your friends and family, or your special someone, and spend a wonderful summer day. Visit the website for more information.